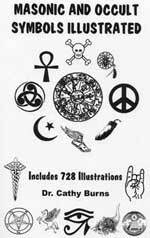 Subtitle: Freemasonry is leading the world into the One-World Religion foretold in Biblical Prophecy. We will study how her very organization facilitates this One-World goal. You may finally understand why Masonry is organized the way she is, and why she can deceive Christians -- especially -- so very well. Suppose that a group of pagans got together and decided that they wanted to form a men’s only club with each man independently deciding that he wanted to start every meeting with a prayer to his demon god. They could all agree to this, but they would have a rough time selecting a name which all could embrace. Hindus would want to worship Vishnu, and of course, the men of other pagan religions would want to worship their demon god by the name they commonly use. They could not agree to use the name for the demon god of any one pagan religion without favoring one religion over another. Additionally, if they choose to use an obviously pagan name for the object of worship, they will have a hard time getting even immature Christians to join the club and participate in worship with them. Of course, that is exactly what the Satan wants.) If they choose a neutral name, such as the Sovereign Grand Creator of the Universe , and open all of their prayers in his name, then all of the worshippers can be satisfied. But are they now worshipping the God of Abraham, Isaac and Jacob, the God of the Bible? No, they are still worshipping demons. Now consider the situation if the Hindus agree to change the name which they use from Vishnu to Sovereign Grand Creator of the Universe. Even if they are able to agree to change the name that they use to identify their demon, certain elements of pagan worship rituals, such as circumambulation, remain. With a substitute name for the demon, would it then be acceptable for a Christian to participate in the Hindu ceremony of worship? What if the Hindus decide that when a man who calls himself a Christian officiates at the services, they will allow him to close prayers to Vishnu in Jesus' name. Would that make it "Christian?" If, over a long, long time , the number of men who claimed to be Christians increased and the number of Hindus decreased, until finally there were no more men who professed to be Hindu taking part in the Hindu rituals of worship, would it then be "Christian?" How is this different from worship in the pagan men’s club? Of course, the men’s club would claim that their club is not a religion. Is the worship of demons through prayer made any less idolatrous by the claim that it is not a religion? It is without hesitation that I accept the third possibility." With an understanding of this passage, it is possible to know that those who organized the paganism known as Freemasonry were not Christians. They were not continuing in the teaching of the Scriptures. Would Christians substitute the name GAOTU for God and do away with the name of Jesus so that pagans could join with them in prayer without being offended? No, true Christians would have shared Jesus with the pagans so that they too might have salvation through faith in Him. It is true that there is one God. However, all men, specifically pagans, do not worship that one God. The worshippers of Baal learned the truth on Mt. Carmel. Baal is not the God of Abraham, Isaac and Jacob. Judgement was swift on Mt. Carmel. (See 1 Kings 18:20-40.) The god of Freemasonry, the GAOTU [Grand Architect Of The Universe], is also not the God of the Bible. Will God judge Masons who do not repent and continue to worship the GAOTU any differently than he judged the worshippers of Baal? What will Jesus tell the Mason who claims to be a Christian? "This is the message we have heard from him and declare to you: God is light; in him there is no darkness at all. If we claim to have fellowship with him yet walk in the darkness, we lie and do not live by the truth. But if we walk in the light, as he is in the light, we have fellowship with one another, and the blood of Jesus, his Son, purifies us from all sin. If we claim to be without sin, we deceive ourselves and the truth is not in us. If we confess our sins, he is faithful and just and will forgive us our sins and purify us from all unrighteousness." If you are a Christian who has become ensnared in Freemasonry, we urge you to confess your involvement in Freemasonry as sin and renounce, as we have. Jesus wants to forgive you, but his forgiveness is dependant on your confession and repentance. Now that we understand that the very organization of Freemasonry is contributing to the advancement of the coming One-World system of religion of the False Prophet and of Antichrist, we can more easily understand how Freemasonry was created so as to enable all men of all religions to join in worship. Though each one voices worship and prayer to the GAOTU, each one in his inner heart feels he is worshipping the demons behind his own god. Then, after a very long time, American Freemasonry no longer has anyone attending who is from a foreign religion, so they stand together as "Christians" praying to the old traditonal demons behind GAOTU. Once we take another quick look at the traditional Masonic symbols that we saw at the beginning of this article, we can see the demonic force behind Freemasonry. Take another close look at this symbol, below. We found this symbol at a Wiccan Witchcraft site, http://www.amulet.co.uk/symbols/penthist.html, in a section entitled, "History of Pentagrams"! I bet you never stopped to think that the traditional Masonic emblem is a Devil's Pentagram, did you? Let us view a traditional pentagram so you will have a point of reference by which to compare this Masonic emblem. As you can see, the Masonic emblem IS a pentagram, with only the left-to-right arms missing. In the early days, Masons intended to display this emblem publicly, so they eliminated the left-to-right arms to camouflage the fact that this was a Pentagram. But, pagans like the Wiccans are not fooled. Listen to their explanation of the camouflaged Masonic Pentagram. Thus, fellow pagans like Wiccan Witchcraft have no trouble seeing the truth, that Freemasonry is one of the many pagan organizations in the world! Pictures do not lie! Also, notice the explanation they give the Eastern Star emblem. "The womens' branch of freemasonry uses the five pointed 'Eastern Star' as its emblem. Each point commemorates a heroine of biblical lore." [Ibid.] While this picture seems to show 10 points, the Eastern Star is really only 5 points, with the other five being just repeated at slightly different angles. 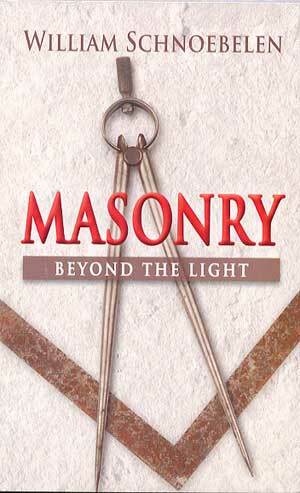 Freemasonry goes to great lengths to disguise its true origins. We are indebted to the Wiccan witches for revealing the truth to us! However, this Eastern Star is more clear than the one accompanying the Masonic Emblem of Virtue and Duty. Once you examine these two symbols carefully, you can have no doubt but that the Eastern Star symbol is nothing more nor less than the Satanic Goathead, one of the most evil symbols ever created by the Satanist! Can you sense the presence of those pagan demonic spirits lurking behind the "Christian" mask of Freemasonry? Not only is the emblem itself in the shape of the Goats-head of Mendez, but the inner part of the emblem is clearly the Goats-head of Mendez! Now, you should clearly sense those pagan demonic spirits lurking behind Freemasonry! Now, let us return to the subject of the very organization of Masonry enabling them to bring all religions of the world into its temples, and to deceive the immature, and Biblicall illiterate Christian into thinking they are Christian. This organization is the reason that the name, Jesus Christ, is not mentioned in any rituals. Remember that a belief in God alone is not enough for salvation and eternal life with Jesus Christ. The Apostle James captures this truth in James 2:19, "
"Thou believest that there is one God; thou doest well: the devils also believe, and tremble." Obviously, the demons who believe in God are not saved; likewise, any person who claims belief in God without also believing in, and trusting alone in Jesus Christ alone for salvation, is not saved. Finally, remember that no one can will themselves into Heaven, nor can anyone claim their way into Heaven. Jesus Christ alone makes the decision as to who is truly His and who is not. Now that you know how the very organization of Freemason contributes mightily to their advancement of the One-World Religion of the coming New World Order, you can get a good idea just how close we are to the End of the Age. Are you spiritually ready? Is your family? Are you adequately protecting your loved ones? This is the reason for this ministry, to enable you to first understand the peril facing you, and then help you develop strategies to warn and protect your loved ones. Once you have been thoroughly trained, you can also use your knowledge as a means to open the door of discussion with an unsaved person. I have been able to use it many times, and have seen people come to Jesus Christ as a result. These perilous times are also a time when we can reach many souls for Jesus Christ, making an eternal difference.